BFG Ageia PhysX PPU card is a physics processing unit that use PhysX PPU chip and SDK that is designed by AGEIA to perform complex physics calculations. 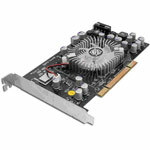 With the PhysX card, computer can alleviate calculations calculations involving physics from a computer’s CPU, allow games developers to design games with complex physics without programming a physics engine, and PhysX chip can perform physics calculations much faster than that of current CPUs and physics software. Other than Sci-Tech Today, GameDaily (dead link) has also reviewed BFG Ageia PhysX card and concludes that while the PhysX card doesn’t necessarily make any games run better, it does significantly improve the overall experience. Although there were some hiccups along the way. For example, you can often tell when objects are being controlled by the PhysX card, and not in a good way. At times, exploding objects throw up a lot of debris and then goes into slow motion while the rest of the game moves at normal speed, like selective bullet-time. Oftentimes, players bump into falling pieces of metal that are still floating in mid-air, making it seem like you’re on a moon mission or low-grav scenario. Shell casings will occasionally pop out from guns, then take five seconds to hit the ground. This will happen even with the rest of the game is working perfectly and does not occur when using the software physics controller.